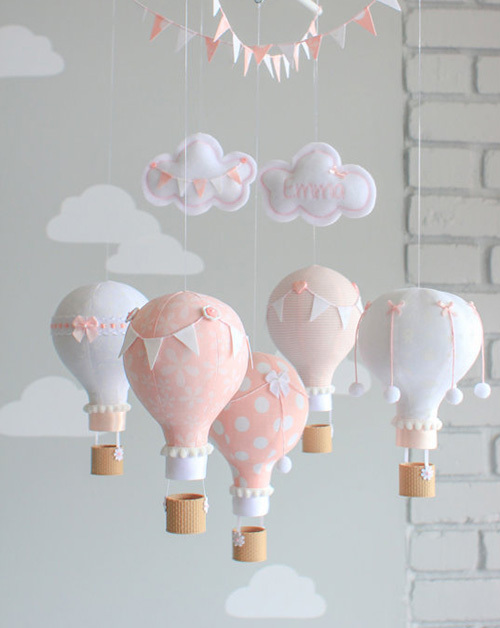 We have hot air balloon nursery theme ideas, décor, crafts and decorating tips for baby girls, baby boys or both! The craft projects we have to show you will give your decorating project a special, personalized look. Before you buy your baby bedding, take a look at the pictures of hot air balloon theme nurseries to see color schemes and decorations that talented moms and dads made themselves. You may be surprised to learn that there are quite a few room themes where these colorful decorations really shine. Yes, they really tend to "rise to the occasion". For example, the artwork, photographs and plaques might be included as part of the wall decorations in a vintage airplane nursery theme or a fairytale princess theme. Choose your mobile in fabric that matches your nursery's decor at Sunshine and Vodka . 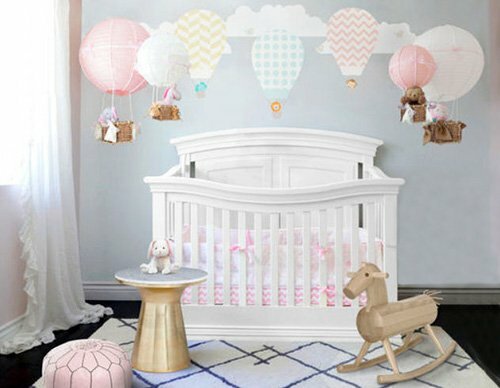 The nursery décor featured in this photo includes a blend of wall decals and DIY hot air balloon nursery mobiles made using paper lanterns and tiny woven baskets with stuffed toy animals inside. The color scheme of the room is a combo of soft shades of pastel pink, blue, yellow and white with metallic gold accent pieces. I love to use these beautifully detailed decorations because they bring in lots of bright color which can otherwise be tricky to work with in a baby boy's room. 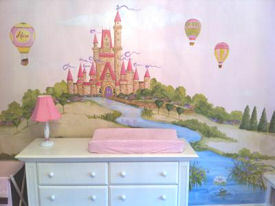 The focal point of this pink, princess nursery mural is the castle sitting high on the hill with flags flying from its many turrets and towers but the multi-colored hot air balloon wall decals are that unexpected touch that give the scene a festive look. Another possibility might be a vintage English garden nursery theme in soft, spring colors. 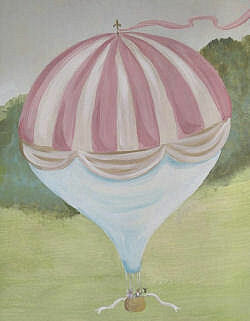 This image is a small part of a large hot air balloon wall mural in a baby girl's elegant pink and green nursery. Look closely at the balloons and you will see that the artist gave the scene a personal touch by adding the baby's name. A Dr Seuss nursery theme for a baby girl is a fine opportunity to decorate with a pretty, pink set of hot air balloon baby bedding. Balloons play a small role in defining the "Oh the Places You'll Go" Dr Seuss nursery theme but still enough to make our list. 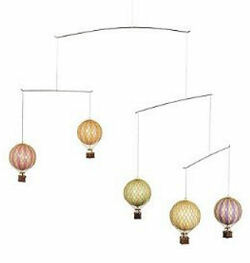 A hot air balloon nursery theme may hold a riot of color or be subtle with a simple color scheme. Wall decals are a popular means of setting the tone of the room but modern styles as well as vintage hot air balloon baby mobiles are a nice touch that live up to their name and give baby something pretty to look at while resting in the crib. Please make plans to visit Unique Baby Gear Ideas again soon to see more nursery ideas that will help when decorating a hot air balloon baby nursery theme for a girl or boy.